Can the US consumer keep spending? Regular readers will know that my take on the US economy in the new normal is pretty straight forward. It is that without high debt and asset price growth, the US consumer must rely on income growth or reduced savings to grow his/her personal outlays. With consumption roughly 70% of the economy, that means slower growth than yesteryear. On the plus side, it may also mean less likelihood of asset price driven recessions. Personal income increased $28.2 billion, or 0.2 percent, and disposable personal income (DPI) increased $18.9 billion, or 0.2 percent, in February, according to the Bureau of Economic Analysis. Personal consumption expenditures (PCE) increased $86.0 billion, or 0.8 percent. In January, personal income increased $26.5 billion, or 0.2 percent, DPI increased $5.0 billion, or less than 0.1 percent, and PCE increased $40.9 billion, or 0.4 percent, based on revised estimates. Real disposable income decreased 0.1 percent in February, compared with a decrease of 0.2 percent in January. Real PCE increased 0.5 percent, compared with an increase of 0.2 percent. 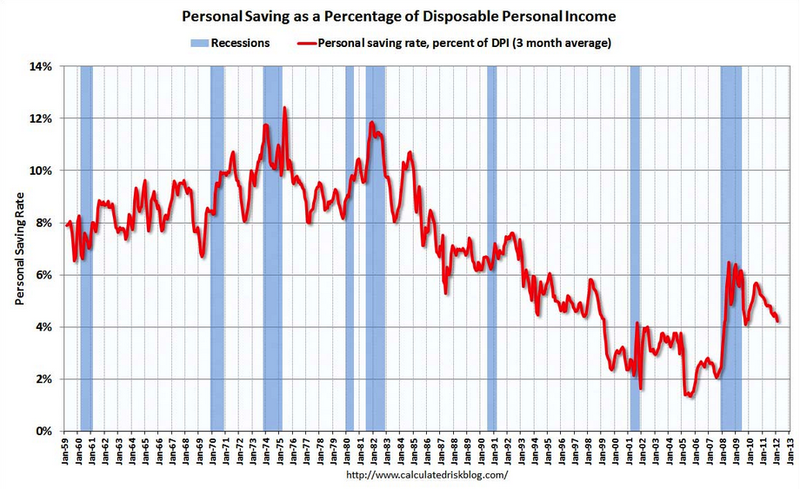 Personal saving — DPI less personal outlays — was $438.7 billion in February, compared with $509.5 billion in January. 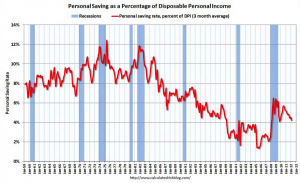 The personal saving rate — personal saving as a percentage of disposable income — was 3.7 percent in February, compared with 4.3 percent in January. Theories of a new normal suggest that this savings rate will remain higher than it did in the post millennium debt boom. You can see, however, that we’re swiftly approaching the ceiling of the former range (and don’t forget that this is a 3 month moving average, on a month-by-month basis we have already punched into the old range at 3.7% for February). I find it hard to believe that the US consumer will give up saving again having been through the GFC but higher consumer confidence on improved employment prospects and an inflating stock market may be enough to keep this trend running. Household asset wealth increased in the last quarter of 2011 for the first time in four quarters and will have improved further in the first quarter of 2012 on a rising stock market and at least flattening real estate market. In the event that this trend continues, you would have to say that the new normal is in fact just some version of the old and that the low household savings rate has returned to what economists like to call an “imbalance”. Something for economists to worry about but not markets, at least until the next shock comes around and the whole thing falls in a heap once more. This is not beyond the realms of possibility. Still, I find it hard to believe. Even the US consumer has his limits and surely the GFC was a generation defining event? I also reckon that the US housing bounce is temporary so some of the positive wealth effect will wane. If the savings rate rebounds the US will slow in the second half, just as it did in 2010 and 2011. The USA was the founding fathers of consumerism in the 1880’s and the humble lift in a Chicago Department store hastened the growth of cities and believe it or not department stores oh and of course Steel for those buildings. What your suggesting HnH is probably one of the most radical coinages and indeed generational changes. The USA can’t actually afford to consume as they have in the past and pretty much squandered resources and opportunity. So really is this not a epic event in that what we’re really looking at is the USA in the new normal. Is the new normal a more cautious and ethical consumer … in fact are we looking at the end of American style Consumerism? If this is the case then surely were looking at the greatest deflationary event in generations … they run a military + consumerist booster economy from my standpoint. If your right this will be 20-30 years of ‘organic’ growth. Maybe the kids grow3ing up now in the USA will have the same view with money as did their great grandparents and the Depression? Can that be a bad thing to save then buy rather than credit. I think it is a great change for all to live within your means and not give away you after tax earnings to a Bank. Sorry I am not an economist but I see radical change all around and some of this is for the better. Now what does that mean for China! What US housing bounce? Your link was to data/charts on increased volumes. Prices are falling. which shows non-seasonally adjusted year on year to Jan’12 is -0.8% for both composite-10 and composite-20 indices. I agree, prices are falling. The US consumer is stuck between a rock and the ZIRP electric cattle prod of Mr Bernanke. Yea shall not save ! Plenty of low interest fan boys recommending the same strategy here. Yep it’s all good if you don’t consider increasing Foreign Debt. For Bernanke the Foreign debt is a free source of unlimited funds (similar to some in this country). Okay, the disposable income is lower, the real income is lower, but the consumed income and is higher and the savings are lower. Doesn’t this mean that more people have to spend their savings to live at the same level of life standard or just to survive? The so called “intangible” exponentials in “Exponentials to love” are the ones which are the only way left for “infinite” growth, e.t. hidden exploitation of the whole nation by financial capital. How much growth has the financial market registered during the last 4 years and how much growth has the real income and disposable income of those who are making the real growth (not the fictitious one) registered during the same period? Isn’t it amazing how disconnected are those two numbers? it is no accident that the incomes for the top few percent grew really nicely in recent years. But for the period 1993-2010 it was 58% for the masters of the universe, and 6.4% for the rest of us. poida, quite simply the greatest wealth transfer (debt transfer) in history from the masses to the top few percent. It was the best system ever devised – whip the masses into a consumerist frenzy, then get them to take on huge debt. Then they give it all to the top few percent through buying *insert thing here*, leaving the top few percent will all the (debt) money, and the masses with the debt, paid back to the banks by working for companies owned by the top few percent. It really makes you understand what is meant by the term “debt servitude”. The masses are completely owned. Here is a good example what is going on. USA is no exception, but the rule in all this middle class drama. It is all about lowering the middle and lower class wages to the level of Asia (China, India etc.). It is no other way of redistributing the middle class wealth acquired during the last century unless the financiers claim as theirs everything they created from tin air. This can happen only with fiat money: banks creating credit, which is disproportional to the real economy, then when everything collapses they can claim their share created by fictitious capital by pushing FED to create the same amount of money by printing them and through hidden and slow inflation (but high in financial markets) the real wealth is redistributed to those who get the printed money as a gift. Simple and genius. No need of explicit exploitation of robbery, it is stealth policy, which is the greatest colossal theft, which can be done only through fiat money system. Lori I must disagree about the lowering of wages. I think it is simply time to reap the wealth of the middle and lower classes. I didn’t mean absolute wage decrease. It is the real income and wages, which QE1,2 and maybe 3 will eat slowly, but definitely. The share of the economy of the financial sector is growing in a slowing economy and that says it all. If they can kick start manufacturing and get it sustainable then they may have a chance. It seems like their current policy is to have everyone run down their savings to fill the void while they get productive, if they do. It’s not a bad plan, but it is pretty much running the economy on fumes. But it kind of makes sense. You need to ask the question “where did the savings come from?” and the answer will be most likely from the debt bubble’s foam. With the bubble deflating, it only seems natural that savings, that were really only drawn out of the bubble, must also deflate away. Only a very small percentage of people’s savings were created from the economic fundamentals of actual increased productivity. I think there is a lot of credit card debt and student loans, car loans etc adding to the total spend of the US consumer. The student debt broke the $1T US mark a little while ago if I recall. The lovely thing about this debt is that it is full recourse, not like some of the housing debt. This has been proven false time and time again – enough of the US housing market is full recourse that it doesn’t affect more than a minority. I’m curious though whether the above “disposable income” includes repayments or not – would that be considered “disposable”? It’s worse than full recourse, you can’t clear it even if you file for bankruptcy. Via TBP: Is the US growing faster than thought.